When I think of cocktails in Hawaii, tropical drinks like Mai Tais, Daiquiris and Pina Colada immediately come to mind. The irony is that the Mai Tai and many other famous tiki drinks were invented in California. The first tiki bar, "Don the Beachcomber" was founded in LA in 1933, quickly followed by Trader Vic's in Oakland while the first Hawaiian tiki bar didn't open until after World War II. But, despite being about a decade late to the tiki scene, Hawaii has fully embraced these tropical cocktails as their own. To be certain there is no shortage of Mai Tais on Maui, and even though almost all of them claim to best on the island, most of Maui's bars are well behind the cocktail revival that has transformed mixology into a culinary art form. Unfortunately, my search for great cocktails on Maui started off on the wrong foot with a horrible pre-mixed Mai Tai complements of Alaska Airlines. 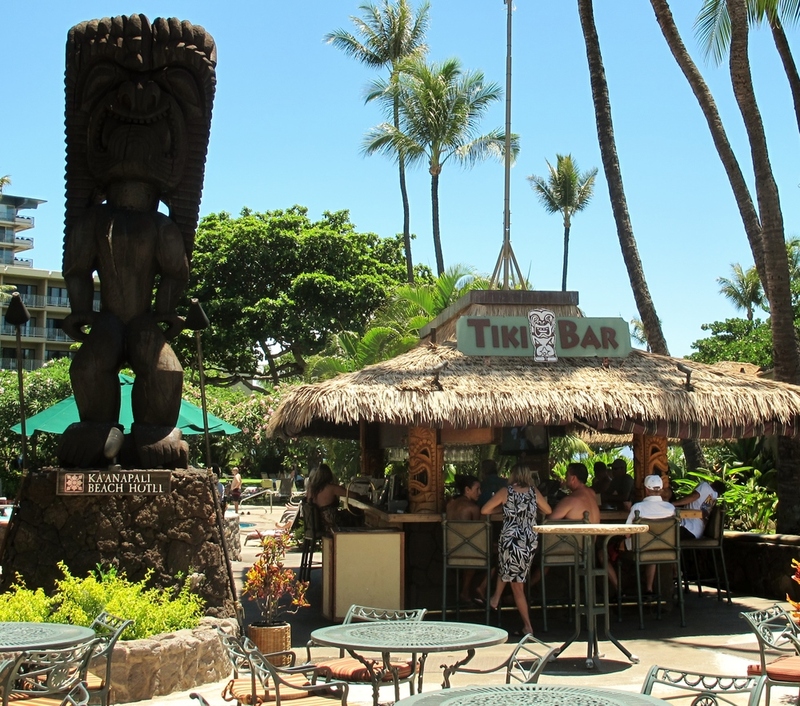 Even the Mai Tai at the Ka'anapali Beach Hotel's historic Tiki Bar was boozy and unbalanced. However, a few duds not withstanding, Maui has a couple of fantastic spots for cocktails that are definitely worth seeking out. Located in Lahaina, Aloha Mixed Plate is a nice beach side restaurant, that serves local food for breakfast, lunch and dinner. Along with their tasty food, Aloha Mixed Plate has a full bar and makes a variety of tropical cocktails. We came for the lunch and I honestly didn't expect much from cocktails but I was pleasantly surprised. We both ordered Mai Tais and they came garnished with a lime wedge and a flower. The Mai Tai was well balanced, so that neither the alcohol nor the juice overpowered the other. It was simple, well executed, and perfectly suited to pair with lunch or dinner. The Mai Tai at Aloha Mixed Plate demonstrates that not every cocktail needs to be overly fancy or complicated to be enjoyable. Located in Wailea, Monkeypod Kitchen is a full service bar and restaurant that prides itself on using fresh local produce. The food menu has a wide range of option and everything we ate was quite tasty. Also, if your are a fan of craft beer, they have the best selection on the island. We came to Monkeypod Kitchen in part because of their cocktail menu and we were not disappointed. Their Mai Tai was probably the best I had on Maui. Served in a large old fashioned glass, it features locally distilled Old Lahaina Light Rum and Maui Dark Rum, and comes topped with a delicious house-made honey-lilkoi (passion fruit) foam. Our second cocktail, the Pod Thai, was a tasty rum drink that captured the spirit of Pad Thai and came in a fun tiki glass. The last drink I tried was their D'yer Mak'er cocktail, in part because I wanted to try a drink that use Swedish Punsch. The D'yer Mak'er had complex flavors that were well balanced between sweet, sour and baking spicy. The drink had a dry finish which worked well with our food. Besides rum drinks, their menu includes a dozen vodka, gin, tequila and whiskey cocktails that are sure to catch your eye and entertain your palate. Old lahaina light rum, crème of coconut, lime, lemongrass-cardamom syrup, thai basil. In the heart of Paia, on Maui's North shore, Dazoo is a farm to table restaurant that has an amazing cocktail program that is creative and artfully crafted by a great team of bartenders. Visiting the bar at Dazoo is a must for any local or visiting cocktail enthusiast. We popped in for drinks on our second to last night on Maui only because a local told me how good their cocktails were. I got excited to try Dazoo because my source told me that they make their own falernum, an essential ingredient for one of my favorite rum drinks, the Corn N' Oil. I was very glad he told me about it because none of my research on where to find great cocktails in Maui had mentioned it, and they didn't have their cocktail menu online. When we saddled up to the bar I studied their cocktail menu that offered a dozen drinks created by James Shoemaker and his team. Two called out to me, and we spent the next half-hour sipping them and marveling at how incredibly unique and delicious each one was. The Dharma Initiative was the perfect blend of sweet, sour, and bitter with a fantastic creamy texture. On the opposite end of the spectrum, the Pho-Bang was an incredibly tasty cocktail that mimicked all the key characteristics of Vietnamese Pho: savory, tart, slightly spicy, and fresh. If we had discovered Dazoo sooner we would have returned to try more of their cocktails, but since our trip was at an end we will just have to wait till next time. But, if you happen to find yourself in Paia, do yourself a favor and stop by for a cocktail. Pau vodka, lapsang souchong, Thai basil, ginger, lemongrass, lime, jalapeno, kimchi olive.